Printed by Kronheim & Co. using the Baxter Process about 1855. After the painting by John Constable which was painted in 1825 and exhibited at the Royal Academy in the same year. The scene is set on the River Stour upstream from Flatford at a place known as the Float Bridge. 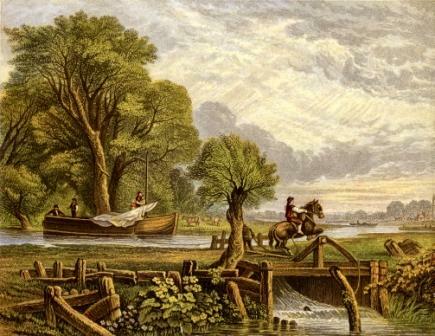 It is one of four prints depicting Constable's works that were printed on the same sheet. The others being River Scene, The Valley Farm, and The Cornfield. Each print on the sheet measures 13 x 17 cm. The original painting of The Leaping Horse is currently on display in the Council Room at the Royal Academy in London. The original painting of The Valley Farm is currently on display at Tate Britain also in London.